USDA Certified Organic Lemon Essential Oil (Citrus x limon) is also commonly known as Limon and Limone. Organic Lemon Essential Oil has a medium-strength clean, fresh, citrusy, and fruity aroma presenting a top fragrance note. Organic Lemon Essential Oil is part of our Cleaning and Energy collections. Part of the Rutaceae family, Lemon oil’s refreshing and vibrant scent conjures thoughts of cleanliness and uplifts the mood. Use Lemon oil to brighten perfumes, massage and bath oils, and DIY nontoxic cleaners. Organic Lemon Essential Oil is great for skin care. Use on oily skin or to coax shine from the hair. Organic Lemon Essential Oil also works well alone or with a carrier oil to remove sticky residue. Mix together and store in a dark glass bottle. Use 6 drops in a bath before bedtime. Or 5 drops in 2 teaspoons of F.C.O. for a massage. Especially relaxing when used the night before an exam, interview, or big presentation. Fill a 4-ounce mist spray bottle. Shake well before using every time. Spray the mist into the air. Keep mist as fine as you can. Phototoxic. Do not expose skin to sunlight or tanning bed for 12 hours after application. To extend shelf life keep in a cool dark place with cap tightly sealed. Can be kept in a refrigerator. For batch specific GC/MS test click here. I put a drop in my 12 oz water for a lemon-y taste. Smells amazing, exactly what I was looking for. I’ve already started using it and love it! I recently started yoga class and the instructor would use lemon oil as part of the relaxation part. I deal with high anxiety levels and thought I would try it in my diffuser at home. I love it! I put a couple more drops and then recommended but this is one of oil I plan on keeping in my home. Fantastic purchase. Pure, citrus scent- a main staple in my EO diffuser blends and household cleaners. Will purchase again! I'm so happy that Rocky Mountain Oils is adding organic essential oils to their collection. I do enjoy using lemon essential oil, and now that they offer it certified organic, I will never go back to another blend. The scent is amazing, and knowing that it's pure from the very beginning makes me feel really good about using it. I enjoy it in my diffuser blended with a little orange and geranium. Thanks, Rocky Mountain Oils! Love the lemon oil, smells so good! Great quality oils as usual! I love the organic option! I hope to see more organic products from RMO soon! Potent and one of my go-to oils. Love the smell! While I don't get essential oils for the smell - I get them for the benefits. But I do really like a good oil that smells good. I mix this with Grapefruit and Ginger and put a drop in some liquid stevia and mix with water for a wonderful drink in the afternoon. First time use of Organic. Glad I did. Very pleased. This is the best smelling of all the lemon oils I have had. I usually prefer the sweet mild aroma of oils made n USA. I use to lean towards Young Living for lemon. But RM organic lemon will be my first choice now. 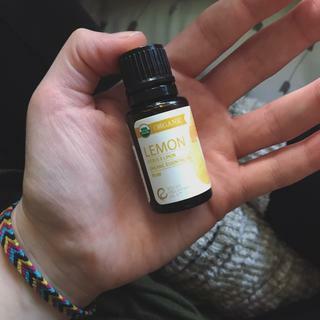 Lemon is such a powerful oil for me, and this one is fantastic. I have only used it aromatically, to assist with my mood, and to help with odors, and it's just perfect. My most used oil. Love this for everything. Cleaning, freshening, and it calms me within a few mins. I mix with other citrus oils for a "happy" but calm blend. I can honestly say this is the best Lemon essential oil. In the past few years, have tried MANY different brands, and this one is the only one where I used up the entire bottle in less than 2 weeks. With the others, because of the 'off' smell, it would take me months, and in one case, had thrown it out. Fabulous, now please offer more organic including blends! I bought this essential oil with the organic kit. The smell is really great, better than the RMO non-organic lemon oil. It simply smells like freshly squeezed lemons and it is really pleasant. I definitely recommend this other the non-organic, just for the better smell. Is this digestible? Can I add a few drop to my water to drink? TIA! BEST ANSWER: Essential oils are very potent and can be dangerous if not used correctly. All of our oils are 100% pure, natural, and authentic. However, we cannot provide dosing suggestions or directions on how to ingest if you choose to do so. If you do choose to ingest the oils, we suggest consulting an Aromatherapist or trusted health professional for guidance. BEST ANSWER: Rocky Mountain Oils feels that essential oils are very potent and can be dangerous if not used correctly. All of our oils are 100% pure, natural, and authentic. They are of the quality to ingest. However, we cannot provide dosing suggestions or directions on how to ingest if you choose to do so. If you do choose to ingest the oils, we suggest consulting an Aromatherapist or trusted health professional for guidance. What is the difference between organic and your regular oils? BEST ANSWER: Great question! All of our oils are 100% pure and organically grown. However, we had a lot of customer requests to get our oils USDA certified as Organic so we now offer certification for some of our oils. The certification process is long and expensive which is why we do not put all of our oils through it. We are planning to add more oil to our Organic line in the future. If this is organic what does that mean regarding your "non-organic" oils... are there pesticides or man-made elements in them? BEST ANSWER: The other oils we carry that are not certified organic, are still grown with organic practices. All of our oils go through extensive GC/MS and pesticide testing through a third party and are required to pass these tests or we will not sell them.